News about my terminal prognosis spread quickly. I encouraged it. Not mincing words, I posted the results of my scans on Facebook. These showed the cancer had spread from my mouth to my lungs. I explained what that meant. My life expectancy was now measured in months. The public post was intended to make it easy for people I knew even vaguely. All they had to do was post a standard phrase or a few heart emojis. But, even this was a comfort. A few hundred people cared enough to not just scroll past. Also, to be honest, it made life easier for me. As we’ll see, words of comfort often make me feel, err, uncomfortable. Anyway, chemotherapy was going to keep me out of circulation throughout the sociable Ibiza summer. But, I hoped the treatment would give me at least a little time before my final sunset. I hoped not to vanish from people’s minds before then. Meanwhile, before the side-effects of the chemo kicked in, I had a few weeks out in the world. That’s when I became aware people were treating me differently. Often, they were clearly uncomfortable. It was the same unspoken question. When somebody’s dying, what do you say to them? Having been on the receiving end, I think I know the answer. It’s the same as you would say to them if they were healthy. Death and disease don’t have to be the centre of conversation, unless the person wants to talk about them. Just listen. The friend with the terminal prognosis may well be just as uncomfortable discussing their illness as you are. Try not to piss them off. Happiness is a disease-free conversation full of trivia, gossip and laughter. Believe me, I was more than fed-up enough when I received my prognosis without people adding to my misery. But, that didn’t mean I wanted to shut myself off from the world. To mangle Oscar Wilde, the only thing worse than being spoken to is, not being spoken to. I’d rather be annoyed than ignored. And I won’t speak about my illness if you won’t. Don’t forget I’m the same person I was before my diagnosis, just with added cancer. I’m as boring or as interesting as I ever was. I’ll happily talk about anything — the weather, the state of the traffic, politics, religion… You name it. I’ll still argue about it. One conversational icebreaker has the power to really upset and annoy me (although I’m usually far too polite to say anything). The question starts, ‘Have you tried?’ This is followed by a woolly description of a treatment or diet they’ve seen on YouTube, in a magazine or, perhaps, maybe, was it a friend of a friend? The teller can never quite remember the exact details. ‘It might work for you,’ they say. ‘I’ll email you more info when I find it.’ Fortunately, these promised messages seldom make it as far as my inbox. The people who make these suggestions are always well-meaning. Unconsciously, though, they can make me feel as if the state of my disease is my fault. I should be trying something alternative, natural and holistic rather than trusting the skilled medical staff who have worked to keep me alive. Cancer treatment is always a balancing act involving risks, benefits and side-effects. Unless you’re a qualified oncologist I really don’t want to know about any half-baked alternatives. I’m too well-mannered to tell you to piss off, but inwardly that’s what I’m thinking. 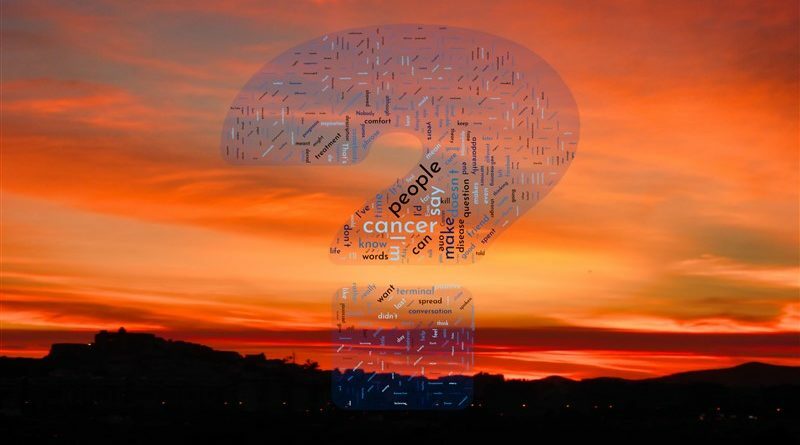 Cancer is a highly complex condition with multiple causes, effects and treatments. Believe me, I’ve already spent too much of my remaining time worrying about what’s best for my disease. To use another annoying cliché, I’ve been ‘battling’ cancer for years. This military terminology has become so ingrained in our language we don’t know we’re saying it. Writing an obituary of a friend recently, I found myself automatically starting a paragraph with, ‘He lost his battle’. This makes it sound as if it was some personal weakness that caused him to die. Nobody ‘loses their battle’ with heart disease. Which brings me to my next pet peeve. That’s when people say, ‘You’re strong. You’ll beat this.´ Or, after I was told the cancer had spread, I’d be told, ‘You’ve beaten it once. You can beat it again.’ No. It doesn’t work like that. If you’ve got cancer in more than one organ it’s almost certainly going to kill you. The only question is when. You can’t think your way out of cancer, although, there’s some evidence staying cheerful might slightly extend your lifespan. All you can say for sure is smiling should help make whatever time you have left more enjoyable, but it’s no cure. Even optimistic vegans die of cancer. ‘Think positive’ is basically the same be-strong theory in a different cliché. What does it actually mean? Is the idea I should be in denial? Is that a good thing? I know denial works for some people. ‘False hope’s better than no hope,’ they say. Not for me. I’d rather try to be realistic. In theory. Sometimes that’s harder than buying a Lotto ticket and trying not to imagine winning the jackpot when you know the odds are 45 million to one. Incidentally, my apparently relaxed attitude toward my illness and the fact I’m not dead yet doesn’t make me an ‘inspiration’ or anything like it. That description just embarrasses me. To me, an ‘inspiration’ is somebody who selflessly decides to help other people at personal cost. I didn’t choose to get cancer and my response to it has been purely selfish. As far as I can, I want to make whatever time I have left as enjoyable as it can be. For me. Nobody else. I’m fortunate to have the sort of personality that copes well with adversity. It’s the positive side of being bone idle. In life, whenever a difficulty has fallen into my path, I’ve looked for an easy alternative. It hasn’t aided my career, but it has helped me cope with cancer. It puts a positive spin on my life as a serial underachiever. Unfortunately, that doesn’t mean I can, ‘live each day as if it was my last’. That’s just a recipe for waking up hungover and skint. And, given my disease, my last day will probably be spent in a fog of opiates. I don’t think that was what was meant by whoever coined the phrase, but, thinking about it, high on heroin is a real rock star way to go. The last phrase that really bugs me is one that, to be fair, doesn’t tend to be used by insensitive friends. But, it crops up all the time in online forums and Facebook groups where people talk about their ‘cancer journeys’ as part of the ‘survivors’ community’. ‘That which doesn’t kill me makes me stronger,’ they say. No it doesn’t. There’s literally a fatal flaw in the saying. Its originator, the philosopher Friedrich Nietzsche, kind of illustrates the point. He wrote it in a moment of lucidity between extreme psychotic episodes induced by dementia or tertiary syphilis. Neither of those made him stronger. On a side note for New Age lovers of the aphorism, apparently it was also the official slogan of the Hitler Youth Movement. That said, there is a variation on the adage which, as a writer, I do like. It goes, ‘That which doesn’t kill you, makes a good story.’ I can go for that. Meanwhile, I’m sorry if I misled you with my opening question and you were hoping for a list of platitudes to use on a friend with terminal cancer. If you want that, Google ‘words of comfort for cancer survivors’ or words to that effect. You’ll find plenty to make you sound like Alexa. That’s not what I want. Just give me conversation — gossip, political argument, the weather, Brexit, football, jokes, you can take the piss out of me and even my cancer. Nothing’s taboo. Anything. Just don’t try to cure me. This article is one of many I’ve written and never published since I was first diagnosed with cancer on April 11, 2013, exactly six years before this was first published. The disease and its treatment hasn’t just affected me physically, it’s also dealt a major blow to my self-confidence. Well, that’s my excuse for leaving my writing lonely, abandoned and hidden from the world on a hard drive. In the absence of an editor screaming for copy, I am trying to kick myself up the arse to get more articles finished. Any encouragement is more than welcome.